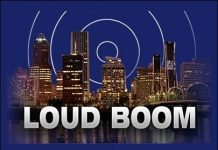 It seems that the loud booms increase again. After a small drop in occurences, they are back and reported from all over the US up to western Canada and Australia. i heard two loud booms coming from the sky almost straight up above me around 11:51-12:00am oct. 24th, 2013 in Odessa washington. booms almost sounded like thunder but no lightning or clouds and crystal clear, sounded to be coming from a southern direction but up very high. i heard two of them between the time above with each lasting 4-8 seconds. It’s October 16th 2013 and my entire family and Facebook friends have heard loud booms in clarksville, TN. My daughter said it sounded like a giant transformer taking over clarksville. Whatever it is, I’m not liking it. It started around 9 and its 11:30 now and i just heard another. If it was military, I wish they would let us know. Tired of the rumble and hope it isn’t serious. Strange sounds in the sky were being heard in Brisbane last night. This sound was continuous, but varied in volume. It was consistent for well over an hour and was loud. When being observed, it was as if the sound was coming from the sky. Then at about 8pm, it slowly lost volume and stopped. Similar sounds have been reported all over the world. Last night in seaford ny my husband and I heard two off sounds in quick succession. Sounded like pressurized air? Was stange did not sound like a plane at all. Did anyone else hear anything? Military trainings may have triggered some. 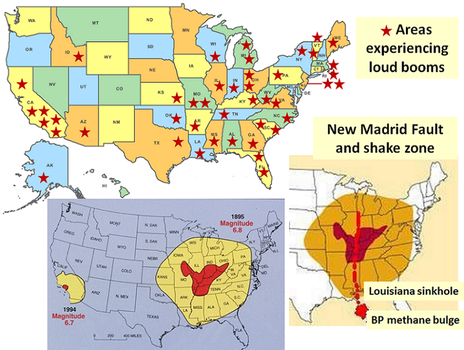 But have you recognized that the booms were heard around the New Madrid fault. Is it going to explode soon? 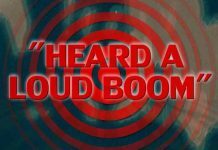 Read this article to understand natural and man-made origins of these loud booms and weird strange sounds. I live in Rotterdam, The Netherlands and I have been hearing these exact same booming noises over the last couple of days! And so have some other people I know… also the weather has been insane since 1.5 week. Hurricane and tornado insane… seriously, normally we don’t ever have this kinda weather in The Netherlands! What’s going on?! 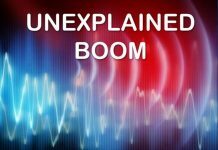 Strange booms heard in Deerfield IL!!!! Just now. For five minutes. i heard it too galiano isl bc canada same time same day. We live in orlando florida and hear it all the time including other people we know. Its very alarming but heard it again tonight december 15,2013. Some are saying its the iron plant x pulling towards us but also say the govermant isn’t going to warn us of anything of this. Don’t know what to think! Hi! I will try to find something! Thank you for this interesting story. However, I haven’t found anything related to it. Did you?